It’s not just WHAT you say, but HOW you say it that makes the difference! You will get results – and have some fun in the process! Bring new awareness to old habits that can distract an AUDIENCE from focusing on your key points – and YOU from delivering them effectively. Liz and Steve’s unique and engaging coaching style will help you develop and enhance your presentation and communication skills – while embracing your individuality. Take tools away for your continual self development and… you’ll receive reminders to practice, practice, practice! Customized, multi-dimensional, interactive workshops improve your presentation and communication skills – and help you differentiate yourself, your team, your strategy, your track record and your firm from the competition. 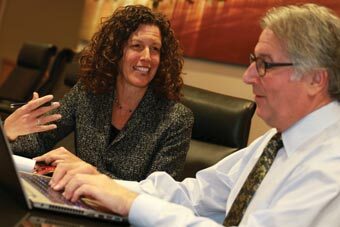 We engaged Steve Felix and Elizabeth Weiner to help us prepare for our upcoming business development roadshow. They worked us hard, and we got results. Liz and Steve have a unique style and incorporate an effective combination of formal coaching and creative (and actually enjoyable) exercises. Their help was invaluable. Liz and Steve get the big picture and are not shy about asking the tough questions. Their presence in the room as objective and knowledgeable third parties pushed us to make important strategic decisions, simplify our story and clarify our message. We wanted to improve our presentations, especially in meetings with potential institutional investors. You came highly recommended by some industry friends. Having completed your program, I can say with no hesitation that our sessions with the two of you have been absolutely invaluable. From a team standpoint we learned about what works and what doesn’t work when we’re together in presentations. I definitely have more confidence in our overall ability to hit our marks in these meetings. We will not launch a new fund without first bringing Liz and Steve in to work with the team. Behavioral Presentation Coaching and Women’s Leadership Workshops!